• On 5 April 2017, Virgin Australia commenced a five-weekly service between Los Angeles and Melbourne. • On 10 May 2017, Jetstar commenced a thrice weekly service between Ho Chi Minh City and Melbourne. • On 1 June 2017, China Southern Airlines commenced a thrice weekly service between Shenzhen and Melbourne. • On 30 June 2017, Qatar Airways upgraded its B777-300ER from Melbourne to Doha to an A380. This creates an additional 54,000 seats per annum. • On 1 September 2017, Japan Airlines commenced a daily service between Tokyo (Narita) and Melbourne. • On 6 October 2017, LATAM commenced a thrice weekly service between Santiago and Melbourne. • On 30 October 2017, Sri Lankan Airlines will commence a daily service between Colombo and Melbourne. • In December 2017, Jetstar will commence a twice weekly service between Zhengzhou and Melbourne. • On 1 June 2018, Air Canada will commence a thrice weekly service from Vancouver to Melbourne using a B787-9 aircraft. Launched in September 2017, Melbourne Airport opened its first pay as you go lounge in Terminal 2 called The Marhaba Lounge. The lounge provides international travellers exclusive lounge access for up to four hours, with Hudsons Coffee, an a la carte food menu, casual lounge seating, shower facilities, a dedicated business section and large dining room. Australia’s first world-class private jet terminal is expected to open in Melbourne towards the end of 2018. Melbourne Jet Base will cater to corporate executives offering a comfortable, efficient and fast way to get into Melbourne with private jets at their disposal. Designed by the award-winning team from Cox Architects, the facility will include an aircraft hangar as well as facilities for private jet owners and pilot accommodation. Scheduled to open in March 2018, the 347-room 4-star hotel, Novotel Melbourne South Wharf enjoys prime position with direct access to the Melbourne Convention and Exhibition Centre and just a short stroll into the heart of the city, making it ideal for business events delegates. Featuring Novotel brand hallmarks such as Live N’ Dream bedding, interactive TVs, FairTrade bathroom amenities, and free barista coffee at breakfast, this hotel adds yet another luxe accommodation option to the South Wharf area. Due to open in late 2018, this dual-branded hotel will see two hotels occupy one building in the heart of Melbourne’s city centre. Comprising the lower tier of the tower, the 270-room ibis Melbourne Little Lonsdale Street offers premium economy accommodation to price-conscious travellers. Novotel Melbourne Little Lonsdale Street will open above the shared public spaces, offering 213 4-star guest rooms and suites. Sharing two restaurants and bars, a gymnasium, and 10 meeting and event spaces, these two hotels suit business travellers, groups and leisure travellers. The newly opened luxury serviced apartments offer two key locations in Melbourne – one in the city centre, and the other nearby in the cultural hub of Fitzroy. Tyrian Hotel offers its guests luxurious apartments incorporating high ceilings, premium furnishings and beautifully appointed spaces. The CBD location offers 85 spacious apartments, while the Fitzroy location offers 36 apartments, all with complimentary Wi-Fi and furnished balconies. Conference facilities are available at Tyrian Melbourne, providing flexible spaces to host corporate functions, team-building activities and intimate gatherings. Due for completion in mid-2018, the current RACV Cape Shank Resort located on the coastal Mornington Peninsula will be redeveloped into a 200-room resort and with a new conference centre with capacity for 500 people. 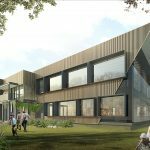 The redevelopment of RACV Cape Schanck will offer a combination of flexible meeting spaces, excellent catering and dining options, and a range of recreation and team building activities. The resort features a fullyequipped gym, tennis courts, day spa and shore-line walking tracks. Ballarat’s historic Peter Lalor Hotel is undergoing a transformation into a creative space called the Pub with Two Names. Slated to open by early 2018, this multi-purpose space is owned by artistic husband and wife duo David and Yuge Bromley of Bromley & Co fame. Once open, this bar, hotel gallery and function space housed in a heritage building dating back to the mid-1800s will be one of Ballarat’s most stylish meeting locations. Located in the seaside town of Ocean Grove, the Ocean Grove Chalet will feature 15 rooms with 21 beds. Due to open late 2018 the accommodation sits on the rugged coastline of the region overlooking the ocean. Each apartment will be designed with luxury in mind and the hotel will feature a heated pool and spa. The Bellarine Peninsula’s Lonsdale Views will emerge from an extensive renovation reimagined as a luxury retreat and spa. Set on 250 acres of rural and conservation land, on a hill overlooking the expansive Bass Strait, this retreat is expected to open to the public in October 2018. Featuring seven boutique rooms and a mineral spa complete with treatment rooms, mineral heated pool and spa, steam showers, water therapy, mineral soaking tubs and private sanctuary spaces, this redevelopment is the ideal accommodation for small premium incentive groups. The construction of Melbourne Convention and Exhibition Centre’s (MCEC) $205 million expansion is progressing as scheduled, due for completion in mid-2018. Adding nearly 20,000 square metres of flexible, multipurpose event space including new exhibition halls and additional meeting and banquet rooms, the new space will be fully connected and integrated with the existing MCEC, increasing the venue’s total size to over 70,000 square metres – the largest convention and exhibition space in Australia. A multi-purpose area with a retractable 1,000 seat theatre and additional adaptable meeting rooms are two of many flexible features throughout the new building that will allow the space to adapt to the needs of customers. The redevelopment of Melbourne Park aims to cater for the growing popularity of the Australian Open and to establish Melbourne and Olympic Parks as an unbeatable sports and events precinct. 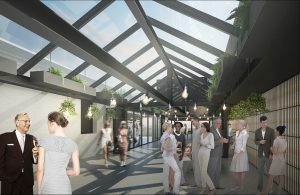 The redevelopment places a strong emphasis on the comfort of patrons, with more open space and shade, increased seating capacity, better connections to public transport and the city, and easier movement into and within the precinct. The multi-million-dollar refurbishment, will significantly enhance every aspect of the customer experience and rejuvenate the external design of the iconic venue. Due to open in mid-2018, the boutique accommodation is set within a historic farm homestead and is located only 15 minutes from Melbourne Airport and 35 minutes from the central business district of Melbourne. Set on 1100 acres Marnong Estate features a variety of spaces for exploring including an operational farm producing Angus Cattle, vineyard, restaurant, farmers market and maze. Ideal for small group overnight stays Marnong Estate features four suites, while the estate can cater up to 200 for conferences, 250 seated banquet functions and a range of team building activities. Early 2018 will see five-star winery Provenance Wines open an operational winery and large function centre on the banks of the Barwon River at the Old Paper Mills site in Fyansford. The largest business in the historic 19th century complex, Provenance Wines will offer an interactive wine experience with a 250-person event space ideal for private corporate functions and incentive meetings. Located at Melbourne Airport, Urbnsurf Melbourne will be the first man-made surf park facility in Australia when opened in early 2018. Thanks to clever, wave-generating technology, visitors of all abilities will be able to have an authentic surfing experience whatever the weather – without a beach in sight. And LED lighting means keen surfers can ride the waves night and day. The attraction includes a fully-equipped pro-shop for board and gear hire, licensed café, and training programs for all ages. Due to open early 2018 Live Wire Park is a treetop adventure experience set in the rainforest just outside of the coastal town of Lorne. Up to 300 people per day can experience a series of rope courses, tree top canopy circuit and rollercoaster zip line. Small incentive groups can experience adventurous team-building activities while enjoying beautiful views from the top. In December 2017 Healesville Sanctuary will launch its new exhibit, Kangaroo Country. Visitors will now descend from the treetops of Koala Forest, walking through a bush oasis and meandering pathways where they will see a range of Australian wildlife, before coming face-to-face with the kangaroos. Scheduled to open in December 2018, Wildlife Wonders will provide visitors with an opportunity to see and learn about Australian wildlife on a guided walk through the picturesque Otway’s region. Located in bushland just outside Apollo Bay, guests can watch koalas dozing in the treetops, potoroos and bandicoots foraging on the forest floor and kangaroos hopping along the horizon against a spectacular ocean backdrop. Wildlife Coast Cruises has launched the newest member of their fleet, the “Brianna Lee”. In September 2017, the team celebrated with her first cruise from Port Welshpool, and will be running regular cruises along the beautiful coastline of Wilsons Promontory from October 2017. The Brianna Lee is a 19mt luxury catamaran with ample indoor and outdoor viewing areas, especially designed for wildlife viewing. The cruiser offers a luxury cruising experience in one of the world’s most spectacular natural areas, untouched islands and rugged coastlines that are not accessible by land, amazing rock formations, spectacular birds and marine wildlife. Fullday and half-day cruises depart from Port Welshpool on Saturdays, Sundays and Tuesdays. Early 2018 will see award-winning hot springs and spa centre Peninsula Hot Springs unveil seven new pools and an amphitheatre designed to host concerts, talks, demonstrations and wellness activities. Further to the redevelopment, a ‘Fire and Ice’ experience will enable guests to try hot/cold therapy via two large saunas, an ice cave and plunge pool. Situated just one hour from Melbourne and 15 minutes from Geelong, Curlewis Golf Club state-of-the-art driving range is expected to be open to the public by the start of 2018. Situated on the Bellarine region, the golf club will feature 18 indoor/outdoor driving bays, two simulators, a mini golf course, as well as indoor exercise and conference facilities for up to 300 people. Known for running interesting, unscripted day tours, highly regarded tour company Localing will introduce a new two-day itinerary from Melbourne to the Mornington Peninsula, Wilson’s Promontory and Phillip Island. Perfect for visitors who want to spend quality time on Victoria’s wild coastline, the two-day itinerary adds to the company’s existing day tours of Melbourne, Yarra Valley, Great Ocean Road and beyond. Recently revamped ‘The District Docklands’ (formerly known as Harbour Town) is a premium shopping and lifestyle destination which enjoys an excellent position within the heart of the city, and is conveniently located in the free tram zone. ‘The District’ offers an exciting mix of direct outlets and specialty stores, entertainment and attractions. The line-up includes H&M, General Pants Co., Platypus Shoes, Skechers, Miniso, Ozmosis, Hype DC, Cotton On, Forever New, Bonds, Canterbury, FILA, Politix, Sportspower. A wide variety of food retail is offered including a Food Truck Park, which features a rotation of some of Melbourne’s best food vendors. Free Wi-Fi for customers is offered throughout the centre. Six years since its inception, White Night is now a synonymous fixture of Melbourne’s cultural calendar. Capturing the imagination of 600,000 people across 12 continuous hours of art installations, exhibitions, films, lighting, projection, music and performance, White Night is a must visit. With four locations (Melbourne, Ballarat, Bendigo and Geelong) two of which are coming in 2018, White Night is an ongoing adventure from dusk to dawn that transforms the city through its artists, landscapes and architecture. Alice’s Adventures in Wonderland exhibition is coming to Melbourne in 2018. The exhibition will explore the many screen adaptations of Lewis Carroll’s classic, which has captivated fans for more than 150 years. Wonderland is a collaboration between ACMI and DreamWorks, using the same theatrical trickery and special effects that have played such an important role in the numerous film adaptions of the book. The interactive exhibition allows people to direct their own experience, engaging their sense of curiosity as Alice did in Wonderland. Running from 23 March to 26 August, Melbourne Museum’s Vikings Exhibition will be the largest collection of Viking artefacts displayed in Australia. Featuring more than 500 treasures from the Swedish History Museum including swords and remains of ships, this exhibition will provide inside into the Viking culture, rituals and beliefs. The works of influential artists such as Paul Cézanne, Salvador Dalí, Marcel Duchamp, Edward Hopper, Henri Matisse, Pablo Picasso, Jackson Pollock and Vincent van Gogh will grace the gallery spaces of the National Gallery of Victoria at the highly-anticipated Masterworks from MOMA exhibition. Encompassing 150 works (some of which never seen before in Australia), the exhibition will explore how artists have sought to be agents of change at pivotal moments in the world’s history. Museum Inside Out will transform the traditional museum experience into a playful and thrilling new experience at Melbourne Museum this summer. The new exhibition will showcase Museums Victoria’s unique collection, the most significant and historic pieces – plus the humble and every day – in a new and creative way. Visitors will become immersed in the theatrical sets, fascinated by bizarre wonderlands and their imaginations engaged in a multisensory journey. Inside Out is unlike anything Melbourne Museum has offered before. New world-class, collections-rich exhibition on the inspirational life of Nelson Mandela. Produced in close collaboration with The Nelson Mandela Foundation of South Africa, this brand-new touring exhibit will make its world premiere in Australia at the prestigious Melbourne Museum, before embarking on its global museum tour in 2019. Opening in September 2018 to commemorate the 100th anniversary year of Mandela’s birth, this official Mandela Foundation exhibition is expertly curated from Mandela’s extensive physical and digital archives, much of which has never-before left South Africa. This captivating new exhibition will be brought to life through original artefacts rare and amazing film, sound and imagery, immersive multi-media environments and scenic re-creations that allow visitors of all ages to engage with, and honour the legacy of this extraordinary world leader. SkyBus, operators of Melbourne’s popular airport express, has launched a new direct service connecting passengers in Southbank and Docklands to Melbourne Tullamarine Airport. The Southbank Docklands Airport Express has been introduced to benefit corporate tenants and hotel accommodation providers throughout the area. Starting November 2017, the new service will have a daily operation from 7am to 7pm and bus frequency of 30 minutes on weekdays and hourly on weekends. The Southbank Docklands Airport Express has four convenient pick up points within the Southbank and Docklands including Harbour Esplanade, City Road (Queensbridge St), City Road (Eureka Tower) and Whiteman Street. The City of Melbourne’s distinctive red coats will be busy greeting some of the 71 million people who pass through Southern Cross Station every year as our visitor services’ volunteers moved into their newest home in the heart of the city’s largest travel gateway. Melbourne’s renowned City Ambassadors have expanded their services to two key sites at the station’s busiest thoroughfare. The new visitor services hubs are located next to the SkyBus terminal and at a kiosk at the intersection of Bourke St and Spencer St.
New multilingual signs are being rolled out along the Great Ocean Road to help international tourists safely navigate one of Victoria’s most popular tourist routes. In an Australian-first, trucks undertaking road works on the Great Ocean Road are now displaying messages in Mandarin and English, to alert international drivers to traffic conditions. The multilingual electronic signs can display 25 different messages and will be used during peak road work periods. I was looking for dates for the Melbourne flower show , but saw no nothing , can you find out some dates ?